Finally! Here’s to hoping that Daytona is the turning point of our 2012 season. All year we have struggled, but we finally seem to have it right. Rossini has built a really strong motor, and OPM has done a wonderful job sorting out the car setup. Unfortunately Race 1 didn’t go to well for Steyn, despite qualifying in 5th place in a deep field. An engine warning light malfunctioned while running in 4th place and Steyn made the safe decision to pit and have his crew do a complete check. Steyn went back out in last and used the seat time to familiarize himself with the track which he had last run in 2009. Despite running solo, Steyn managed to qualify his car in 4th place, confirming that the new engine is a big step in the right direction. 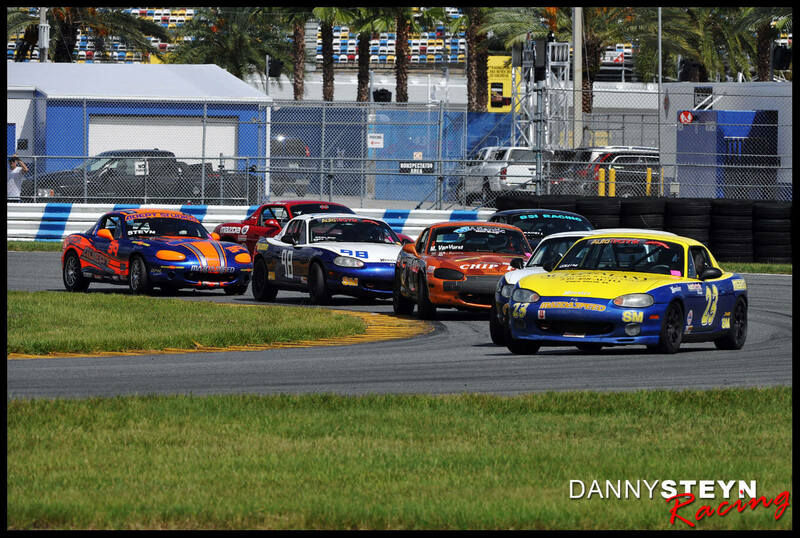 Sunday’s race 2 was an incredibly exciting scrap with wheel-to-wheel racing the entire race. There were two Full Course Yellows that brought the pack together and there were two intense and chaotic restarts. Steyn raced a calculated strategic race, coming out onto the back straight in 2nd place behind Andrew Carbonell, ready to make the last lap slingshot. Unfortunately it was not to be, and although Steyn did pas Carbonell, both Steyn and Carbonnel were passed by the bump draft train of Rollan and Tucker, and finished 3rd. Steyn did however set the fastest race lap 1/1oth second off the lap record. In the end Steyn was declared the winner when Rollan was DQ’d for contact and Tucker was moved back two places for jumping the restart. 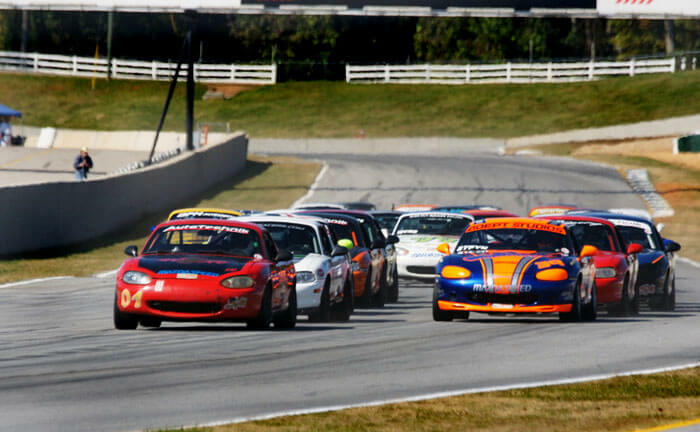 Cory Collum leads Jamie Tucker, Matt Van Vurst, Andrew Carbonell, Andrew Charbonneau, Danny Steyn and Tom Burt. 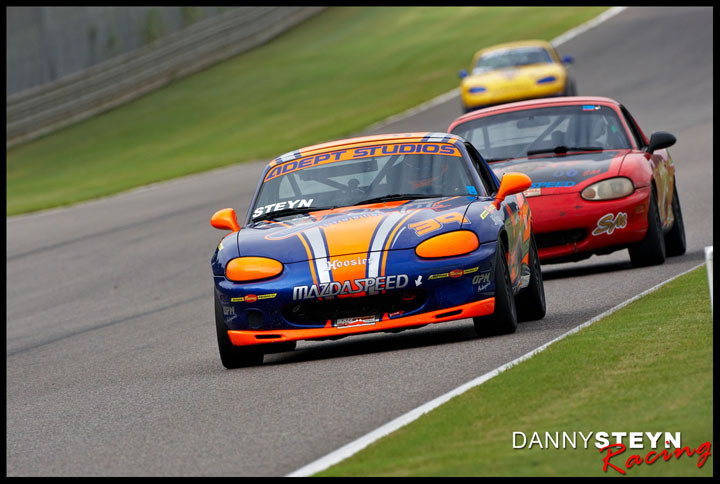 ◊ If you are not sure how much fun Spec Miata racing is, then watch the video below. And if you are not sure how important bump drafting is – take a look at the segment from 8:00 to 9:30 and the segment at the finish 18:50 onwards – You’ll quickly understand!!! !